The 7-1 ruling, made on very limited legal grounds, doesn’t explicitly reaffirm or overturn previous decisions permitting the use of race as a factor in university admissions or UT-Austin’s specific program. That pretty well ensures that America’s long-running debate over affirmative action will continue awhile longer. While Americans overwhelmingly agree that society should ensure equal opportunities for all, the divide over values related to affirmative action programs remains as wide as ever. 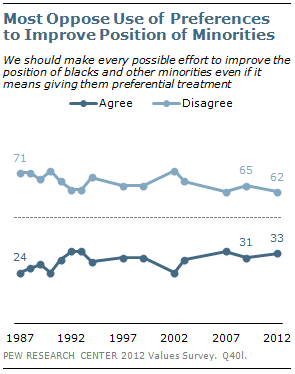 Pew Research surveys going back to 1987 show only a quarter to a third of Americans agreeing with the statement that “We should make every possible effort to improve the position of blacks and other minorities, even if it means giving them preferential treatment.” But support is sharply split by race: When we asked the question last year, 62% of blacks and 59% of Hispanics agreed with the statement but only 22% of whites did. And while 44% of 18- to 29-year-olds agreed, about a third of all other age groups did. Concern about preferential treatment doesn’t mean people disagree about the importance of equal rights. In the same survey, 86% said society “should do what is necessary to make sure that everyone has an equal opportunity to succeed.” However, only 76% of Republicans agreed with the statement, compared with 95% of Democrats and 85% of independents. Nor is there a broad sense that the issue of race is in America’s past and not its present. Overall, 61% disagreed that “discrimination against blacks is rare today,” a figure that included 71% of African Americans but also 60% of whites. Yet when it comes to what steps should be taken, the issue is more complicated. Overall, 42% agree with the general statement that “we have gone too far in pushing equal rights in this country,” including 32% of blacks, 42% of whites and 55% of Hispanics. In many cases, the political divides over these issues are wider than the racial or ethnic differences. And as with many other issues, the debate over affirmative action is becoming more polarized along partisan lines, largely due to increased support for such programs by Democrats. 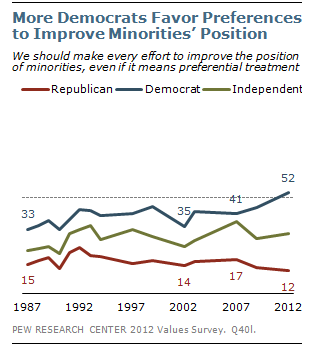 When Pew Research first began asking the”preferential treatment” question back in 1987, only 33% of Democrats supported the principle; by 2012 that figure had risen to 52%. 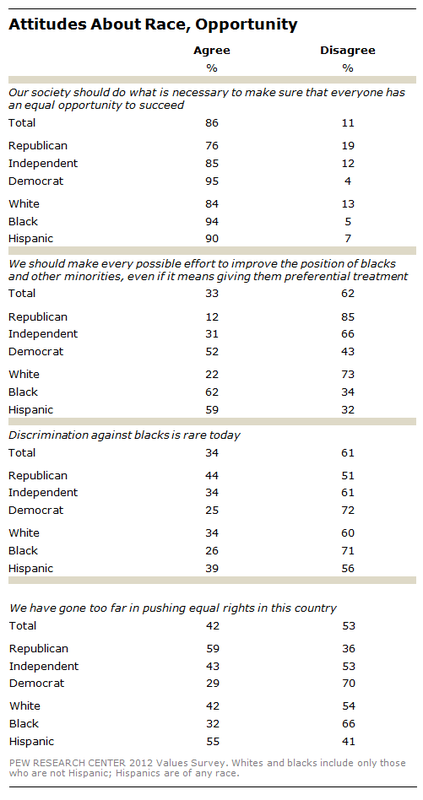 Meanwhile, Republicans have remained solid in their disapproval: Just 12% agree that we should make every possible effort, including preferential treatment, to improve the position of blacks and other minorities – virtually unchanged from 15% a quarter-century ago.